President Donald Trump’s White House is relying on a sweeping interpretation of executive privilege that is rankling members of Congress on both sides of the aisle as current and former advisers parade to Capitol Hill for questioning about possible connections with Russia. The White House’s contention is that pretty much everything is off limits until the president says it’s not. The argument was laid bare this week during former White House chief strategist Steve Bannon’s interview with the House Intelligence Committee. His attorney got on the phone with the White House counsel’s office, relaying questions and asking what Bannon could tell Congress. The answer was broad: Bannon couldn’t discuss anything to do with his work on the presidential transition or later in the White House itself. President Donald Trump’s longtime spokeswoman Hope Hicks is scheduled to appear Friday for a closed-door interview with the House Intelligence Committee. That’s according to a person familiar with the committee’s investigation who spoke to The Associated Press on condition of anonymity because the person wasn’t authorized to speak publicly about the matter. Hicks is a close aide to the president and a key eyewitness to Trump’s actions over the past several years. She served as his spokeswoman during the 2016 presidential campaign and serves as White House director of strategic communications. Hicks will follow other Trump associates. Former White House chief strategist Steve Bannon met with the panel Tuesday. Former campaign manager Corey Lewandowski and White House aide Rick Dearborn spoke with the committee Wednesday. 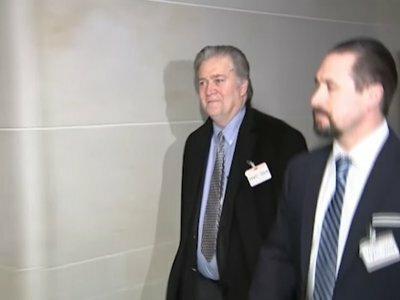 Steve Bannon’s attorney relayed questions to the White House during Tuesday’s House Intelligence Committee interview of the former Trump chief strategist, people familiar with the closed-door session tell The Associated Press. As lawmakers probed Bannon’s time working for President Donald Trump, Bannon’s attorney Bill Burck was asking the White House counsel’s office by phone whether his client could answer the questions. He was told by that office not to discuss his work on the transition or in the White House. It’s unclear whom Burck was communicating with in the White House. Tuesday’s conversations were confirmed by a White House official and a second person familiar with Bannon’s interview. They spoke only on condition of anonymity because they were not authorized to speak publicly on the matter. The House Intelligence Committee wants former White House chief strategist Steve Bannon to produce documents as part of its ongoing Russia probe, multiple sources said Wednesday. The panel also has the power to compel him to return for additional questioning under the subpoena issued yesterday, those sources said. They spoke on condition of anonymity to discuss private committee deliberations. Bannon and the White House spurred a rare bout of bipartisan anger Tuesday when he refused to answer questions during his marathon interview by the House Intelligence Committee. The committee sources said that they want more information from him — including documents — but would not specify what has been requested or what they want to know more about. Former White House chief strategist Steve Bannon will meet with special counsel Robert Mueller’s investigators. That’s according to a person familiar with the decision but not authorized to speak publicly about private conversations. Bannon is expected to be interviewed by prosecutors instead of testifying before a grand jury. He is expected to cooperate with the special counsel, the person said. It’s unclear when the interview will occur. Bannon, the former head of Breitbart News, appeared before the House Intelligence Committee on Tuesday but refused to answer questions about his time on the Trump presidential transition team and in the White House. It’s unclear who Burck communicated with or whether it was top White House lawyer Don McGahn. Burk is also representing McGahn in special counsel Robert Mueller’s investigation into contacts between the Trump campaign and Russia. Former White House strategist Steve Bannon has received a grand jury subpoena from special counsel Robert Mueller as part of the investigation into Russian election interference and possible ties to President Donald Trump’s campaign. Word about the subpoena comes from a person familiar with Bannon’s closed-door interview with the House Intelligence Committee on Tuesday. This person wasn’t authorized to publicly discuss Bannon’s interactions with Mueller and spoke to The Associated Press on condition of anonymity. The New York Times first reported the grand jury subpoena. Bannon refused to answer questions from the House committee about his time on the Trump presidential transition team and in the White House. A top Democrat has said the White House imposed a “gag order” on Bannon. —Associated Press writer Chad Day. President Donald Trump’s former campaign manager, Corey Lewandowski, and senior White House aide, Rick Dearborn, are being interviewed Wednesday behind closed doors by the House Intelligence Committee looking into Trump campaign contacts with Russia. That’s according to two people familiar with the committee’s work who spoke to The Associated Press on condition of anonymity because they weren’t authorized to speak on the record about confidential interviews. Lewandowski led Trump’s campaign for nearly a year before being fired before the general election. He has remained close to Trump and been a prominent defender of the president on television. Dearborn was a campaign aide who later served on the presidential transition before joining Trump in the White House as deputy chief of staff. He is expected to leave the White House later this month. Former White House chief strategist Steve Bannon has been subpoenaed by the House Intelligence Committee after refusing to answer a broad array of queries about his time working for President Donald Trump. The development has brought to the forefront questions about White House efforts to control what the former adviser tells Congress about his time in Trump’s inner circle and whether Republicans on Capitol Hill would force the issue. The congressional subpoena came the same day The New York Times reported that Bannon has been subpoenaed by special counsel Robert Mueller to testify before a federal grand jury. Mueller is leading one investigation of potential coordination between Russia and Trump’s presidential campaign, as well as possible obstruction of justice.